BESTProto delivers on a broad range of quick turn PCB assembly and short-run, low volume electronic assembly services. We specialize in quick-turn pcb prototypes and small to low volume electronic contract manufacturing. In addition to original equipment manufacturing printed circuit boards, we have experience in building quick turn burn-in boards and demo-board assemblies. Our assembly technologies encompass through-hole to fine pitch surface mount. 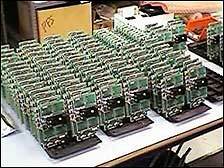 Quick turn PCB assembly projects can be handled as consignment or turnkey method. BESTProto can assembly your prototype(s) and in most cases have them back in your hands within days when required. Quick Turn Electronics With BESTProto quick-turn circuit card & PCB assembly services you will get uncompromised quality with all projects being assembled and inspected per the proper industry-wide accepted IPC or customer criteria. Each prototype is assembled with the highest quality in mind. Each assembly will be defect free so engineers can start working on the functionality of your new design, and not on chasing down quality defects which add time and cost to your assembly. We can meet the quantity requirement that you may have for your quick turn pcb assembly job: 1, 10, 100 or more. There are no minimum quantity requirements. With an average of 20 plus years of electronic assembly experience, and in most cases, a decade or more of experience in the engineering/prototype field we can assure you that no matter how difficult your assembly may be, your product is in the highly skilled hands of our quality personnel. This experience makes a difference when time is of the essence and a quick turn SMT assembly is required. Complete electronic assembly, difficult wire modifications, non-native chip additions, trace cutting and bill of material corrections are just a few of the quick turn services we provide. If you can dream it, we can build it for you. We provide quotations quickly-especially when we know that you need quick turn circuit card assembly services. BESTProto needs a bill of materials, a silkscreen layout and we will have a quotation back to you in a fast timely fashion. Please allow us to quote your job; we promise you will be surprised.